Public health workers are fighting for the climate crisis to be treated as a public health crisis, and say their demands along with labor are not being addressed at COP20, says Jean Ross of the National Nurses United Council of Presidents. The gathering of official government representatives at the 20th conference of the parties, also known as COP 20 climate change conference in Lima, Peru, is making some headlines around the world. But getting less mainstream media attention is the parallel grassroots event that’s called the People’s Summit on Climate Change, also taking place in Lima, Peru. These are civil society organizations, including labor unions. They have a very ambitious goal: to develop an alternative form of development, one that respects the limits and regenerative capacities of the Mother Earth and tackles the structural causes of climate change. Now joining us from Lima, Peru, to discuss their role is Jean Ross. Jean Ross is an acute care nurse and member of the National Nurses United Council of Presidents. Thank you so much for joining us, Jean. JEAN ROSS, MEMBER, NATIONAL NURSES UNITED COUNCIL OF PRESIDENTS: I’m glad to be here. PERIES: So, Jean, let’s get why the Nurses Association is at the conference. And what are you hoping will come out of your presence there? ROSS: Well, the reason nurses are interested in what’s going on now is because we realize that the climate crisis actually is a health crisis. It’s become an emergency. And in order to do what we do best, which is to advocate for patients in society, health in general, we have to be at the forefront and with other groups in support of the same things that are going to work. And what we know will work is true energy democracy with public ownership. We see in our own country how awful our health care system is, if you could call it that, because it’s private for-profit. Until you have that in the hands of public control, things aren’t going to change. 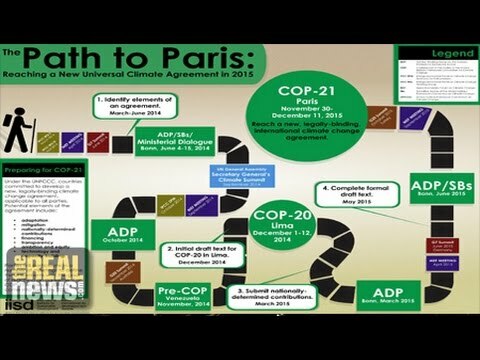 PERIES: And how much does the agenda of the People’s Summit on Climate Change influence the official COP 20 conference that’s going on parallel to yours? ROSS: Well, that’s a good question. The reason we all come together is to hopefully generate a general movement, because the people understand what we’re doing, and society in general agrees with what we’re trying to do. Our voice isn’t really listened to if you take into account the COP 20. So we’re hoping to form a movement so that we can push forward our idea about a just transition, one that’s really ambitious and one that’s enforceable. PERIES: Now, how many of you are there? I know you are there as a part of a international labor delegation. How many people are in the People’s Summit, and what other kind of organizations are also present there? ROSS: Well, there’s about–well it’s international unions. There’s us, the United States, the United Kingdom, there’s Argentina, there’s Brazil, Peru, Canada. There’s all kinds of social groups, whether it’s a green group [incompr.] indigenous people. Everyone who is worried about or has already been affected by the changes that have been induced by corporatization of our industry is here putting their ideas forward and supporting one another. PERIES: Right. So let’s get specific. What are the kinds of things that the nurses in particular are interested in addressing vis-à-vis climate change and the impact on people’s health? I know various studies has pointed to the alarming rates of asthma, cancer, and other medical conditions. Can you elaborate on that? And are those kinds of items coming up in your discussions? It looks like these are universal trends. ROSS: Absolutely, if you look at simply what we’ve done at home; and as we talk to our friends around the globe, it is the same. We’ve done work at home on anti-fracking legislation, for example. We see, just as you mentioned, the asthma, increased incidences of cancer. It’s interesting that they talk about, for example, the pet coke piles, notably those that are piled up around Chicago. And they talk about–when the industry finally admitted there might be a problem, they talk about the [transient (?)] trends towards your respiration. Nobody really knows the long-term trends. But we do know that the asthma and the respiratory problems are affecting the people that are most close to the area. And those tend to be underprivileged, poorer communities. We’re doing a lot of anti-fracking work. Notably, we look at the Keystone XL Pipeline that should be transferring the tar sands from Alberta. We’ve been very active, along with ATU, against that. And it’s because we know that a few jobs cannot make up for the health effects that we are going to see, that we see now and we’re going to see in the future for people. PERIES: Right. And given that there’s such large civil society groupings at the summit, is there any interaction with the official Summit? Like, are you going to get a chance to speak to the American delegation? And do you have a process of input to those negotiations? Well, that’s a very good question. It feels like so far–as I said, I don’t think our voice is really heard. Certainly we have excellent statements. Our own union has a wonderful statement, the ITUC. All the groups have come together with a general statement stating what I said before. We need true energy democracy. There has to be a change in the system in order for things to truly change. We are all in agreement on that. As to whether or not the COP 20 takes that into account remains to be seen. We are firmly committed that our ideas for the just transition and energy democracy be put into effect no later then the COP in 2015 in Paris. PERIES: Right. And also one of the other things that are going on is that the oil lobby and the fossil fuel lobby is also there. Is there any activity taking place between the People’s Summit and the fossil fuel lobby? ROSS: Not that I know of. PERIES: Alright. Jean, I want to thank you so much for joining us and giving us a sense of what’s going on there in Lima, Peru, at the People’s Summit.